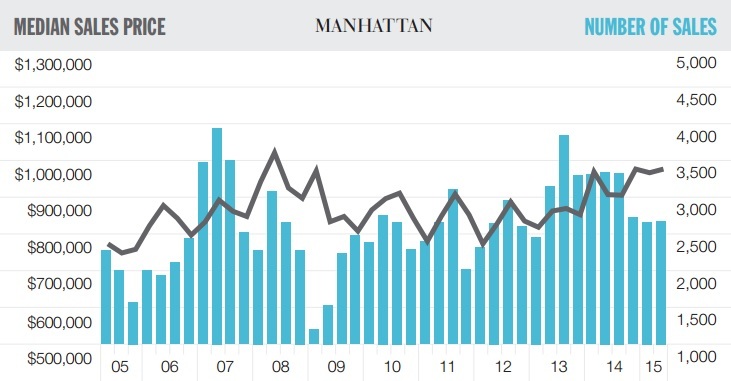 The second-quarter market report from Douglas Elliman is fresh off the presses, and it shows that Manhattan sales have never been more expensive, averaging $1.87 million for all apartments, which is an 11.4 percent jump from this time last year. New developments averaged $2,011 per square foot, which is the first time ever prices have exceeded the $2,000 per square foot mark. Other records set during this quarter are for median co-op sale price ($795,000, up 9.7 percent from last year) and average price for luxury apartments ($8.2 million, up 12.8 percent from last year). The median price for Manhattan sales also rose dramatically by 7.7 percent to $980,000, which is the second-highest price ever. But the number of sales fell 20 percent, from 3,342 in the second quarter of 2014 to 2,674 this year. 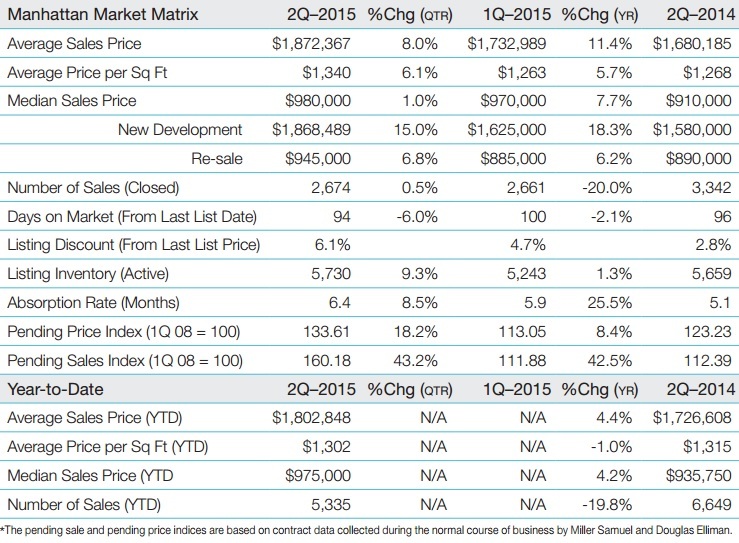 This has been attributed to absorption from the abnormally high demand of 2013 and 2014. While we might assume that the record-setting prices are the result of new development sales, this is actually not the case. Jonathan Miller, author of the report and president of real estate appraisal firm Miller Samuel, told Curbed, “This time, we have a record average and median set for the co-op market, and that’s not a new development-influenced market. The condo market average sale price set a record, but if you remove new development from the mix, average, median, and price per square foot for resale condos all set records as well.” Because of a lack of inventory, 50.5 percent of all sales went for their asking price or higher, which is the highest percentage since the financial crisis.